If anyone was ever tempted to think that preserving is only a summer activity, time to think again. It can easily be almost equal to summer in the preserving of earthy winter vegetables plus zesty, tangy citrus fruits and many more besides. I’ve just made a tub full of sauerkraut with fresh, organically grown, crispy cabbages bought from BIg River Growers Market in New Norfolk, Sauerruben which is similar but made with turnips, and sour beets, both of the latter made with produce from our garden. We are having a sausage making day here at the school in July and I am hopefully that they will be ready to eat by then. These vegetables, preserved by the fermentation method, are traditional and perfect accompaniments to the sausages we will make. 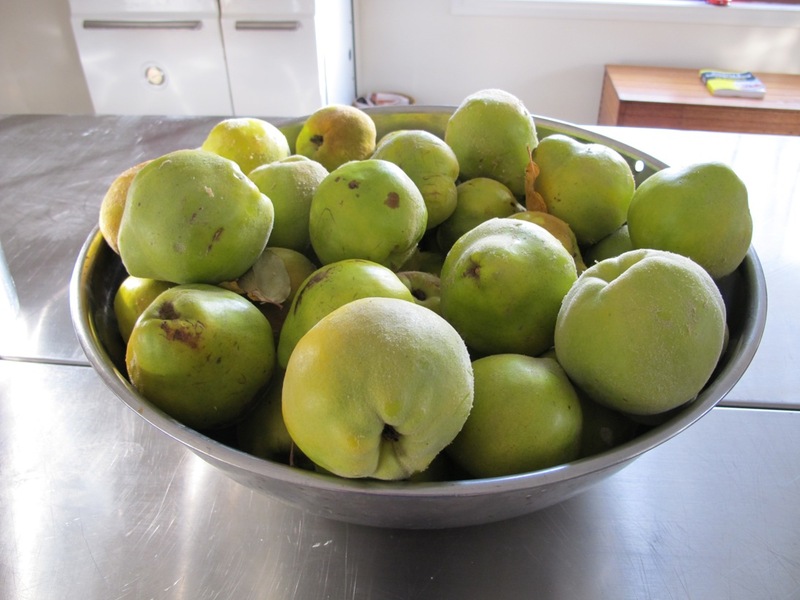 The cooking school tables and benches are covered in the fruit and vegetables of winter waiting to be preserved – apples, quinces and cumquats and pink peppercorns, all which came at the best possible price – free! 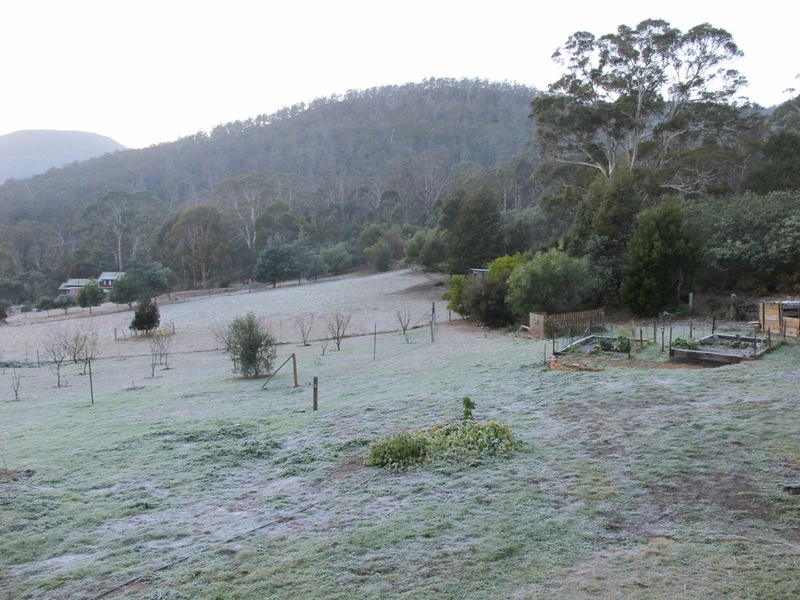 Such is the abundance of produce here in the Derwent Valley and the generosity of the people of Tasmania who are always happy to share any excess produce from their gardens. Then to be found are the unusual bits and pieces from alongside the river or going to waste in fields. Long before the term “foraging” became such a popular term, for decades as a family we sought out what the fields, river banks and abandoned or neglected orchards had to offer. We met some amazing characters, salt of the earth farmers, happy for some-one to use the fruit falling from the trees, and only too pleased to tell the stories of when that particular tree was planted, how its fruit had been used to make preserves and puddings in their earlier days. I’ve been given jam melons as well, a treasure not so appreciated in recent times. Of course you can make melon and lemon jam, or melon and ginger, or melon and pineapple for that matter. However, a year or two ago our Courtney invented melon cheese, made exactly like quince cheese. It is extremely delicious, perfect served with a soft cheese like camembert. Only a little remains now. I so with I’d made more. The melon made a really good cordial syrup as well. exquisite colour ond soft fruity flavour. And then there’s the onions. Winter is time to pickle those of course and I was fortunate enough to find a 10 kilo bag a few days ago. They are now pickled and settled in their jars, ready for the eating in a few weeks time. I’ve trialled 3 different vinegar mixes this year just by way of comparison when it comes to the tasting. By now I’m thoroughly in a pickling mood and have just boiled up a pot of eggs and used my remaining malt vinegar to make English pub style pickled eggs. Later today I’ll play with those cumquats – some marmalade of course, but cordial syrup is always good. Brandied too of course, and then a little experimentation with steeping them in vodka to make a singularly cumquat liqueur. The brandy is lovely, but I’d like to capture just the flavour of the cumquats, free of the taste of such a strong flavoured spirit. Then there’s preserving them in a strong sugar syrup, but the amount I have may not stretch that far. Never mind, the tree is just down the road and can easily get some more. And then there’s the medlars from our tree, and soon to be joined by more from our friend’s tree. 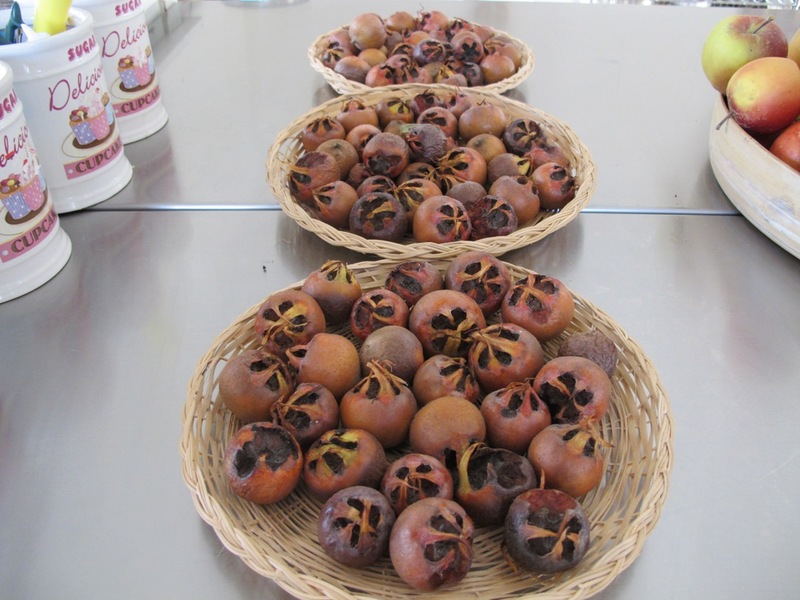 These are quietly bletting on straw platters, waiting to be made into the specialty of the house – Medlar Liqueur. Our lemon tree is thriving with a huge crop of lemons steadily ripening, with a promise of plenty of preserving of those in the weeks to come. It’s incredible to think the tree is doing so well, given the frosts here at Molesworth. Limoncello is high on the list of priorities, and lemon cordial, sparkling lemon and salted lemons. So although the wonderful berries and stone fruits of summer are past, look a little closer and you will find so much in the environment, in gardens, at Farmers Markets and beyond that can still be captured in a bottle, perfect to enjoy in the months to come. Hi Jasmine – didn’t receive your message yesterday sorry. As to the most practical preserving kit? Well, I have a great fondness for the Fowlers Vacola stainless steel thermostat controlled model. It’s not cheap but it will last for decades, or at least all mine have. You can get a similar thing from Ozfarmer – it works well, but does not take the taller Fowlers bottles. You can purchase a cheaper Fowlers unit – it’s what used to be called an All Rounder. However, I find it just boils the jars – I like to have more control over the temperature to make sure as many nutrients as possible are retained. I re-use the Fowlers bottles year after year. As to the rings, Fowlers recommend that you buy new ones each year. However, if they are in good condition after their first use, I have been known to use them for a second year. There is the risk though, that the jar may not seal as well and you could lose the bottles on which you’ve re-used the rings. I’d recommend, if using Fowlers jars, to always use stainless steel lids – the other sort can generally only be used once. The stainless steel ones can be used for years and years. There are many types of preserving jars on the market now – for instance, Agee, or even just heat proof one litre screw top jars (don’t know the brand, but buy them from Plasdene Glass Pak). The are not so good as the others as lids need to be replaced each year, but on the other hand they are inexpensive and do the job fine. 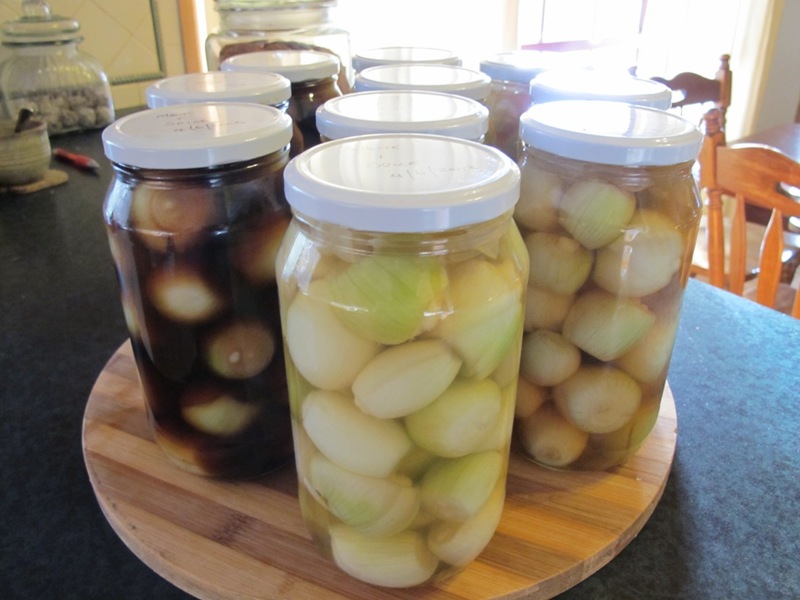 There are Ball Mason jars, attractive but expensive – available through OzFarmer also. Hope this helps. Call in to see us when you are in Tasmania. I am very envious of those plums – they sound just wonderful! I was hoping you could advise me on how to bottle beetroot using fowler water bath method or any other method so they don’t need to be refrigerated. 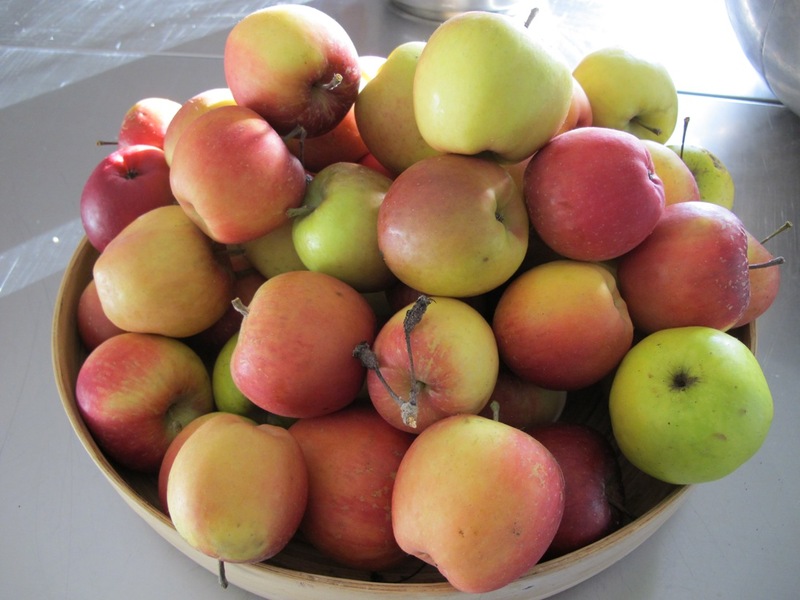 I’ve used them in sauerkrauts, as well as cooked and bottled with sugar, vinegar mixes before, but I have a glut and want to keep them without using precious fridge room! Hi Abby – here (below) is the method I use, in which case it doesn’t need to be water-bathed. Cook the beetroot in boiling water, then peel and slice or dice and pack into sterilised jars. Combine remaining ingredients in a large saucepan. Bring to the boil, then remove from the heat. Cover and allow to stand for 20 minutes to allow the vinegar to cool a little and the flavours to infuse. Strain and pour over the beetroot, making sure that the beetroot is well covered with the liquid. Seal immediately. If you prefer a less vinegary solution, you could substitute one cup of the vinegar for water, in which case it would be advisable to preserve it by the Fowlers method, namely – place the jars in the preserver, fill with cold water to cover the tops of the bottles, place lid on preserver, turn temperature dial to 92 degrees C and leave for one hour for small jars (Fowlers size 20) or one and a quarter hours for sizes 27, 28 and 31 and one and a half hour for sizes 36 and 65. Hi Ann-Marie – this fine shred marmalade is the old fashioned style where the outer layer of the skin is used (for its colour, flavour and essential oils) and the juice for the pectin, acidity and flavour. This marmalade is like the ones that were a pride and joy to marmalade makers of generations past (and for many people today). The reason that the white pith part just under that outer layer of skin is not used is that it can make the marmalade cloudy and a little bitter. The fleshy part has its goodness and other qualities, as mentioned above, imparted to the juice. The result is a beautiful, clear orange jelly with pieces of fine shred skin suspended in it. It looks amazing and tastes sensational. Hi Kath – you don’t absolutely need to. However, in this cold weather I place the sugar in the bucket, add 4 cups of boiling water, stir to dissolve, then add the remainder of the water cold. It is only then that I add the crabapples, lemon etc. You don’t want hot water to come into contact with the crabapples as this will kill the wild yeast that assists with the fermentation process. Hi.we have preserved beetroot but there is a white creamy looking sediment at the bottom.wot has caused it and is the beetroot safe to eat. Some of the beetroot may not have been fully ripe.thanks. Not sure what that white sediment might be at the bottom of the jar. I’d view it with caution, might have to be relegated to the compost heap. Personally I wouldn’t risk eating it. Hi, I’m no expert in preserving, but in response to the above comment re sediment with beetroot, I just read in my Fowlers book that apparently sediment is common with preserves such as pickles and this does not affect the preserve ( I imagine the beetroot were pickled). It was under the section on troubleshooting and sediment. Maybe this helps.